A lot of people receive home care treatment here in Colorado because of illness, recovery from surgery, disabilities, disorders, etc. Home care takes many forms, depending on the situation. In this guide, we are going to focus in different topics to provide a full understanding of home care classes, the roles of home care workers, the basics of insurance coverage, payment for services when you do it from your own pocket, and much more. In general there are two home care classes: professional (government programs, such as Medicare and Medicaid) and personal (private insurance companies), however we are going to provide more information for a better understanding of both home care. The professional care: is provided by a nurse, physical therapist, occupational therapist, speech therapist, or social worker. The doctors will prescribe professional services when they determine it is medically and absolutely necessary. If your family member needs professional care, you may also qualify for some type of personal care. Personal care: is provided by a home health aide, workers called home assistants, personal caregivers, or helpers. One thing to keep in mind is the companions and home helper services which are third class will provide non-medical care. · Clean the wound for patients who have just had surgery. · They carry records of blood pressure and other vital signs. · Observe changes in the patient's condition. · Check the patient's medication. · Develop a care plan for the patience. Physical Therapists (PT): they teach the patient to perform some strengthening exercises and flexibility, also the PT can help you decide if your family member needs special equipment, such as grab bars and handrails, as they can also arrange for someone to install them. Speech Therapists: They will work with language skills, such as helping a person recover from a stroke to speak clearly again, this process will take longer depending of the situation can be months or years. Occupational Therapists (OTs): The main job is to help people re-learn skills such as eating and dressing themselves. They show the person who is weak or disabled how to get out of bed and reach a chair. Social Workers: They will help you to apply for benefits and offer advice on services such as a day care center for adults or respite (free time for the family caregiver). They can also talk to you about your concerns and other issues that might be in your mind. Home Health Caregivers: First of all they will primarily provide personal care, which includes assistance with feeding, bathing, dressing, walking, etc. As well as activities related to independent living, such as shopping, preparation of food and go to the laundry. 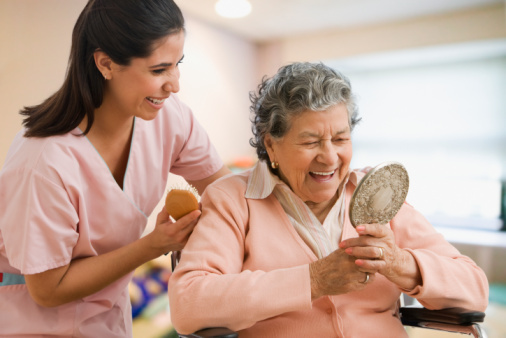 Home health care workers are allowed to do certain tasks related to health and personal care. For example they can take the temperature to the patient, control the blood pressure, change a dry dressing (not one that has blood or pus), help the patient perform exercises to expand the range of movements, such as simple stretching, moving the arms and finally the legs. In general, they are not allowed to give medication to the patient that is totally forbidden, as each state has different rules regarding what they can and can’t do. Keep in mind something please, that a home health aide is generally related to home only to provide patient services, and is not supposed to provide services to the spouse or the rest of the household, now there is something we can add here if you pay from your own pocket and talk to the person, you can assign tasks that include other household members. (Some managed care companies will include caring for a child if the patient is the head of the family). A very important fact to know, personal care assistants share many of the same tasks as home health aides, but the big differences between home health care attendants and personal care assistants depend on each state's training requirements. Common mistakes around people, they believe that personal care doesn’t require many skills that is something extremely easy to do but it’s not like that, some tasks can be very challenging, such as bathing a person with dementia (they believe you are trying to steal or kill them, eventually they will use brute force on you) or moving extremely obese people who can’t move by themselves to make basic needs. What are the different kinds of home care agencies? There are different kinds of agencies, below we are going to list them with proper information. Home Health Services Agency (HHA): is licensed by the state and is certified by Medicare and Medicaid to provide professional care. These agencies also provide personal care either through their own home health aides or through assistants working for another agency with which they have a work agreement, such as a home care agency. Home Care Agency: provides home care aides, personal caregivers, or home helpers who provide personal care, transportation to medical appointments, and homework assignments. Some home care agencies also provide nurses and other trained staff. Home care agencies can be contracted to provide personal care through Medicaid for someone in need of home care for an extended period of time. Some states require home health agencies to be licensed if they participate in Medicaid. Non-medical or companion agency: in general is not licensed or covered by insurance (an exception could be long term care insurance). Some workers may be trained health care assistants, but it depends on the individual worker. Often, non medical agencies are small, local businesses that are franchises of large, registered companies. Employment or registration agencies: they provide the names of people available to provide care at home. Your family member's condition may also be kept on record. This can often be found through the state department of health. Home care can make a big difference in your life and in the life of your family members. Being a family caregiver doesn’t mean that you should give up everything and everyone else, however home care does require work on your part. You must establish a good plan, make sure it works, and then carefully monitor to see when changes need to be implemented.